"The Oasis on the Plains"
"Welcome to Colby!" Take time to experience our progressive community located on the high plains in Northwest Kansas on Interstate 70 just 53 miles east of Colorado and 42 miles from Nebraska. 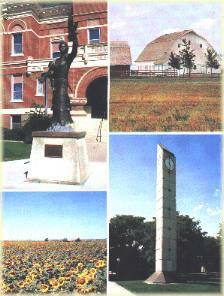 Colby is home to many attractions including Kansas' biggest barn at the Prairie Museum of Art & History, Northwest Research Center, abundant parks and recreational facilities and the picturesque Thomas County Courthouse. Shopping includes outstanding retail, outlet and discount establishments. Thomas County is primarily an agricultural area growing wheat, corn, sorghum, sunflowers. Livestock production is also vital to the area economy. Quality of life abounds for our citizens and visitors alike. Community annual events are a source of pride with special events of interest all. Awaiting you are over 500 motel rooms and a large variety of dining establishments. Colby is the service center for the Tri-State area. It is the home of Colby Community College, a modern airport, numerous churches, progressive medical care with two care centers and hospital. We are proud of our warm, friendly people and invite you to join us. Thomas County has 10,950 acres of walk-in hunting.